Want your brows lifted but don’t want to use Botox? We’ve got you! Come in and let our Master Injector use our dissolvable Nova threads to lift your brows! It’s quick and easy! A very small smooth thread is placed above your brow. Then in 4 to 6 weeks as it dissolves collagen production starts where it forms a mesh that will lift and tighten the skin! Nova threads can be used to lift areas on and off the face! Need a lift? We can help! 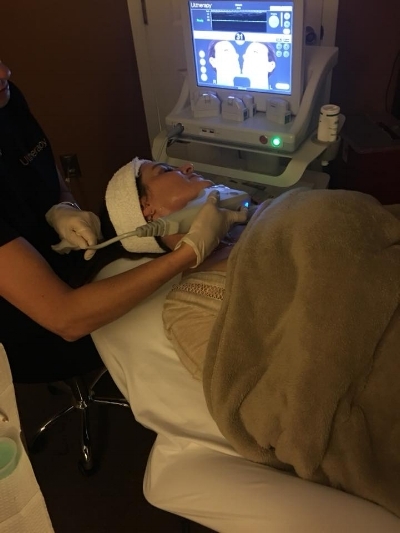 Jessica our Master Injector performed an advanced thread lift last Thursday on our owner, Janie! She used our dissolvable smooth and twist Nova Threads! These threads will dissolve over the next 4-6 weeks leaving behind the natural collagen and elastin that her body has produced in response to the threads! The threads in her cheek will form a support mesh to lift the jowl area, the threads above her lips will give definition to the border of her top lip, the threads in the marionette lines will fill and add volume to that troublesome area, the threads above her brow will give a brow lift. BTL VANQUISH ME... Designed For EVERY BODY!!! Skintastic Med Spa is proud and excited to announce the arrival of this best in class treatment! A Vanquish Me treatment is FDA approved to reduce up to 2 inches of unwanted circumferential fat! It treats abdomen, belly, flanks and love handles all in one session! No pain and no downtime! Fast and affordable! The only Med Spa in Hernando County with Vanquish Me! That’s the Skintastic DIFFERENCE! Call today to schedule your free consultation and save big while targeting stubborn fat! VANQUISH ME is the only selective RF system for contactless, non-invasive FAT REMOVAL treatments! Not only is RESTYLANE the world’s FIRST dermal filler but now it has just officially been named as “Best Injectables” in the 2017 THE Aesthetic Industry Awards. Bringing you the very best this industry has to offer at super affordable prices! Call today to find out just how easy it is to refresh your look! We can’t wait to meet YOU! This patient came in because she was concerned about the discoloration on her skin. After a consultation, we then took pictures with our professional camera system! We looked deeply at the brown and red discoloration! She was able to see the true health of her skin, like never before! We then treated her skin with the most accurate and precise laser on the market. With healing serums and sunscreen on... she’s ready to go! She will come back in 4 weeks and we will take her pictures again and compare the images side by side! Our consultations and Reveal images are always FREE! That’s the Skintastic DIFFERENCE! Call today to schedule your Reveal session! experience the skintastic difference with botox cosmetic. Discover the proven results that 11 million women and men have experienced. With real, noticeable results, no surgery and no recovery time, there are many reasons why BOTOX® Cosmetic, developed by Allergan, has been chosen by millions of women and their doctors. If you feel like the moderate to severe glabellar lines between your brows make you look tired or unapproachable, ask to find out if BOTOX® is right for you. If you have already been treated with BOTOX and you are pleased with your previous results, you may want to consider regular treatments every 3 to 4 months to help maintain them. Visit our blog post discussing our cosmetic injectors! See how you can experience BOTOX results at a much, much lower price! if you like botox®, you're going to love dysport. Stand up to those lines with Dysport. If you’re seeking treatment to improve the look of wrinkles between your eyebrows, Dysport may be for you. Dysport is a great alternative to BOTOX®, and Skintastic is excited to offer this affordable treatment to our patients. That's the Skintastic difference! Be sure to sign up for Aspire Rewards to receive deals directly from Dysport! Call today to find out how you can get started with Dysport! Be sure to read our blog post discussing Dysport procedure in depth! Skintastic utilizes Sciton Forever Bare BBL for our laser hair removal treatments. The benefits are discussed thoroughly in our blog post on Skintastic's laser hair treatment and benefits, but Sciton's technology has many benefits compared to traditional laser hair removal solutions. In addition to the motion BBL technology, the thermo-electrically cooled sapphire plate on the Forever Bare BBL hand piece provides continuous cooling, even at maximum power, to keep the skin cool and comfortable before, during and after treatment. The procedure happens in just moments. Watch below as Janie demonstrates the procedure in just under two minutes! Please visit our blog post detailing the cutting edge laser hair technology utilized by Skintastic. You won't find better in Spring Hill, Florida! Price: Prices vary depending on region, please call today to receive more accurate pricing information! Our specially formulated Jessner's Peel is compounded from a local pharmacy and is an excellent choice. A Jessner’s peel is a medium-depth peel that is designed to improve more extensive skin damage than an alpha-hydroxyl-acid peel can provide. It is made of salicylic acid, for penetration, lactic acid for exfoliation and resorcinol (which is great for the treatment of acne). It is designed to remove superficial layers of skin, dry out active acne, dislodge blackheads, reduce shallow wrinkling and scarring, help lighten hyper pigmentation and improve the overall appearance and health of sun-damaged, acne prone, aging skin. Chemical peels first gained popularity in the 1960s when skin-care options were few and far between. Chemical peel treatments have remained a favorite because they can resurface and refresh the skin by diminishing the appearance of fine lines, wrinkles, sun damage, enlarged pores, hyperpigmentation and acne scars. Skintastic offers a variety of peels to lighten dark skin pigmentations and help vanish fine lines and wrinkles. Our licensed aesthetician will select the professional peel ingredients for your skin care needs. Say good-bye to skin imperfections and hello to a burst of skin renewal with our custom peels. Containing a mix of specialty blended acids, this peel is suitable for all skin types. It will increase blood flow and add radiance to your skin where results are visible just after one treatment. This particular chemical peel is ideal for patients who have had ongoing problems with fine lines and wrinkles, acne, hyper-pigmentation, melasma (also known as pregnancy mask), and sun damage. If you are looking to improve your skin’s clarity, tone, color, or texture, this is the peel for you! This being the deepest level of peel through the SkinMedica line, it is indicated for more moderate to severe skin conditions. Highly effective in producing immediate results with little or no down time, this chemical peel will drastically improve your fine lines and wrinkles, severe cases of acne, pigmentation changes, melasma, and overall sun damage. There is a much noticeable difference in the appearance of the skin just days following the procedure. For those who are looking to turn back the clock, a series of these peels will help get you there! The world renowned 'OPERA' mask is not only a low-level light therapy LED facial mask that utilises 3 wavelengths to provide a multitude of skin rejuvenation treatments to the face and neck. Skintastic is always looking for ways to make our patients' experience with us exciting and new. End your next treatment with a relaxing 30 minute Opera mask session. That's the Skintastic Difference! Call today to find out about our other great services to utilize with the Opera LED Face Mask! The Ultrasonic Scrubber resurfaces the skin and loosens impurities while gently washing them away leaving you with healthy, glowing, beautiful looking skin. The Ultrasonic Scrubber has a peeling or exfoliating function that sends strong ultrasonic vibration generated at the tip of the scrubber causing water to get mixed with dirt, toxins, bacteria and cosmetic residue. The undesirable residues are vaporized, revealing a fresh clean layer of skin. The Iontophoresis Pulsing function maximizes the penetration and absorption of topically applied products such as moisturizing serums, corrective serums and healing compounds. This treatment is safe for all skin types, including sensitive, acneic and rosacea skin and is imperative for oily to combination skin. It is a must for patients experiencing acne. Juvederm, developed by Allergan, is the smooth gel filler that is used to instantly smooth away wrinkles around your mouth and nose and add volume to the lips. In as little as one treatment, you’ll get smooth and natural-looking results that last up to a year. Young, healthy-looking skin contains an abundance of a naturally hydrating substance called hyaluronic acid (HA). But as you age, sunlight and other factors can reduce the amount of HA in your skin. The lack of HA causes your skin to lose structure and volume, creating unwanted facial wrinkles and folds – like those parentheses lines around your nose and mouth. Using a dermal filler like Juvederm is a safe and effective way to replace the HA your skin has lost, bringing back its volume and smoothing away facial wrinkles and folds. Everyone will notice, but no one will know. Price: On Special for $800 (normally $1000) this month only! Many people wonder how to get rid of hand wrinkles and age spots! Now you can improve the appearance of your aging hands with Radiesse and an IPL laser treatment! RADIESSE is the first and only filler deemed safe and effective by the FDA to correct lost volume in hands! The IPL laser will treat and correct the discoloration while the RADIESSE is proven to immediately restore volume loss in the back of the hands for smooth, natural-looking results that won’t give away your age! Bringing you combination therapy for the very best results this industry has to offer! That’s the Skintastic DIFFERENCE! 352 610 9900 Call today to schedule your free consultation! We can’t wait to meet you! *** Mix PRF (platelet rich fibrin collected from your own blood) in with your syringe of Radiesse to further enhance your results and hydrate the skin cells for an additional $75. Belotero Balance, developed by Merz Aesthetics, is a dermal filler as unique as you are. It is specially designed to integrate into your skin and mold to your distinct contours. By adapting to the individuality of your skin, it softens lines and wrinkles for smooth and natural results that are uniquely you. Belotero Balance Dermal Filler has unique properties that allow it to adapt within the skin for soft and even correction. The versatility of the product makes it strong enough to handle deep treatment areas such as nasolabial folds (smile lines around the mouth), yet soft enough to treat more delicate areas such as vertical lip lines and the tear trough. Belotero can be used so precisely and accurately, its as if wrinkles are airbrushed right off the face, leaving behind a smooth surface. Belotero targets specific concerns where fine lines can form and can also be injected more superficially compared to other hyaluronic acid fillers, giving it unique precision. Belotero is made of a material called hyaluronic acid or HA. HA naturally exists as a component of your skin. By binding to water, it fills in wrinkles and folds, allowing immediate and smooth correction. An innovative Syneron skin care device, the eMatrix™ system takes a non-invasive, non-laser approach to treating facial wrinkles, acne scars, uneven skin tone, and skin laxity for a wide variety of patients. The eMatrix system uses Sublative Rejuvenation™ technology, which is considered much safer and gentler than traditional fractional laser skin treatments. The eMatrix system delivers sublative rejuvenation with fractionated bipolar RF energy, harmlessly penetrating surface skin to correct existing imperfections in the deeper, dermis skin layer. Since the eMatrix system doesn’t utilize strong lasers and is completely non-invasive, patients of various skin tones and skin sensitivities can be successfully treated. The eMatrix is an exciting new device because it has minimal social downtime, affords a deep dermal impact with noticeable skin enhancement, and is safe and effective for all skin types. The treatments are very quick (typically 10-15 minutes) and have little to no discomfort. The average number of treatments performed per patient with this device is 1-5 (depending upon the condition being treated and the pre-treatment condition of the skin). Since eMatrix mainly corrects cosmetic skin issues, eMatrix treatments typically aren’t covered by insurance. A highly effective treatment featuring microdermabrasion and skin tightening. Skin Tyte by Sciton BBL delivers targeted and deep heating to effectively coagulate soft tissue encouraging new collagen with no downtime! Add Salicylic Acid peel for only $20.00. A great choice for those wanting to combat break-outs or simply prevent them.